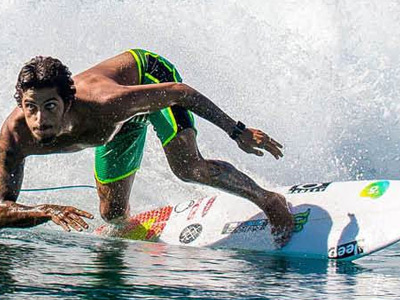 The Right Surf Stance: Take Your Surfing To The Next Level! Let’s talk about surf stance! The term Goofy foot came into existence after Goofy, a character in Walt Disney movie, surfed by putting his right foot forward, unlike the majority of surfers that put their left foot forward when surfing. This cartoon character was a left-hander and seems to prefer goofy surf stance, so now you understand. Avoid assuming that being a left-hander automatically makes you a goofy footer or being a right-hander automatically makes you a natural footer. This is a generalization because there is no absolute rule about it. Are you a goofy or natural footer? In case you are enthusiastic about skateboarding or snowboarding, the same thing is applicable to surfing. If you have no experience with skateboarding or snowboarding then assume that you are moving swiftly on the ice and about to slide, which of your feet would be put forward as you slide? When sliding, you will experience a certain comfort zone in a particular position over another. In one position, you will experience stability and strength while you will feel awkward and uncertain in the other. For better utilization of your water time, understand your stance in advance. There is no need for you to waste good waves on understanding something you are capable of learning from the comfort of your home. However, the position of your front foot and back foot on the surfboard is not the only thing to know about surfing stance. Your turns, acceleration, balance as well as general maneuvering display when you are on the wave will be greatly improved if you can adopt an optimum stance while you are on the surfboard. A low surf stance will assist you in maintaining your balance if you are new to surfing. However, you should avoid going too low. As they are catching their first waves, inexperienced surfers are advised to ensure that their feet are kept shoulder-width apart. Simultaneously, they should bend their knees for impact absorption and keep their hands close to the rails of the boards or, at the minimum, at the waist level. It is essential for people that are new to surfing to understand the appropriate surfing stance before getting into the waves. Through optimization of weight distribution and adjustment of the body to the regular morph of the wave, new territories in wave riding will be seamlessly unlocked by an appropriate surf stance. The right placement of your feet on the surfboard is the first step to a good body position. In case your position is too distanced on the tail, you will end up miring the surfboard, slacking off and ultimately blotting out. As a basic guideline, the surfer should place his feet over the stringer and focus on the board’s width. One of the majorities of mistakes that beginners, intermediate and even some experienced surfers make is the poo stance. Just as the name indicates, when riders use the poo stance, their posture looks like that of someone sitting on the toilet seat with the knees facing different positions. What you are doing is surfing, not using the toilet seat. Steer clear of this by any means necessary. Not only does this stance look bad, but it will also prevent the movement of your hips as you try to limit your movement on the face of the wave. During the process of surfing, it is important for you to be able to handle the movement of the surfboard forward, backward, above the heels and above the toes. Nevertheless, rather than pointing their foot sideways, lots of first-timers position their front foot to look forward. This position is known as the open stance. An open stance allows you move forward and backward; however, it makes it impossible for you to control your movement from side to side because your front foot is looking in the direction of the nose of the surfboard. For any surfer, the specific wave that he wants to ride should be used for determining his stance. When paddling into a wave that is small, slow and mushy, the feet of the surfer may be moved forward in the direction of the nose of the board and maintained in a comparatively low stance to ensure that surfing continues. However, in case you are riding on a medium-sized wave that is fast and hollow, you are compelled to move your feet back closer to the tail as you are taking off to ensure that obliteration is prevented. In case you are surfing in a surf break that is affected by the wind, it may be important for you to reduce the center of gravity to take in the impacts that the rough waves produced. Big wave surfing also requires the same rule. To maintain balance, reduce the risk of blotting out, and take in unforeseen bumps, extreme surfers have the tendency to crouch. Low Surf Stance: an exceptional method to maintain balance. As soon as you start surfing, the trick lies in your ability to transfer your weight from the tail until it reaches the center. The aim is to optimize the time you spend surfing and ultimately maneuver as much as possible. However, the surfing stance is similarly, and at the same time, an important gas pedal and brake. Whenever there is a need for you to speed down the line to beat a crumbling section, you should ensure that your weight is shifted backward. That is, make sure your back knee is bent. When it comes to maintaining the balance as well as using the ideal surfing stance, your arms are very essential. After you have turned up and started riding on a wave, focus on your destination and free your arms. It will be noted that your front arm will be near the left rail of the surfboard while your right arm will be kept far back, above the right tail and near the tail of the board. Unless there is pressure from the back foot heel and toe, the board will never make the right turn. Your back foot acts as the accelerator pedal. Although your front foot has no effect on the turning process, it offers you balance. For you to make a proper turn, place your back foot above the top of the front fins or negligibly at the back (based on the length and type of surfboard). When a bottom turn is performed, you apply pressure to the back foot, with the main focus on the toe pressure; as a result, the rail in the tail is sunk, the fins are utilized, and the board is allowed to get to the rail and speed during the turn. Even after application of back foot pressure, a few individuals still have difficulties with making a turn due to the fact that their foot has moved too forward. A back foot traction pad is excellent equipment because it allows you to know the specific position of your foot. When using only wax, it will be difficult to tell where your foot is. With the aid of the traction pad, the tail of the surfboard is protected and the issues of denting from back foot pressure are relieved. During the shift from a bottom turn to a cut-back, the back foot is pressurized once more, focusing on heel pressure, so that the rail is sunk, the fins are utilized and the board is allowed to bend during the turn. If excess pressure is applied to the front foot during a cut-back or bottom turn, the center portion of the rail, simply forward of the front foot part, will slash into the water, ensuring that the rail is dug in and the board is slowed down. This is generally known as a rail catch. A false impression is that a rail that is softer and rounder will not catch but an edge that is harder will catch. Without a doubt, this is a fallacy. It is only when the front foot is pressurized excessively during a turn that a rail will catch and bog. Evidently, the turning process is largely dependent on flexibility and your body mechanics….however, to perform an excellent turn, the primary rule is back foot heel or fron foot toe pressure. Interested in taking your surfing to the next level? 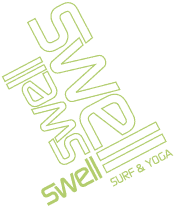 Or if you have never surfed before, why not learn to surf in the warm Caribbean water on the North Coast of the Dominican Republic with Swell. 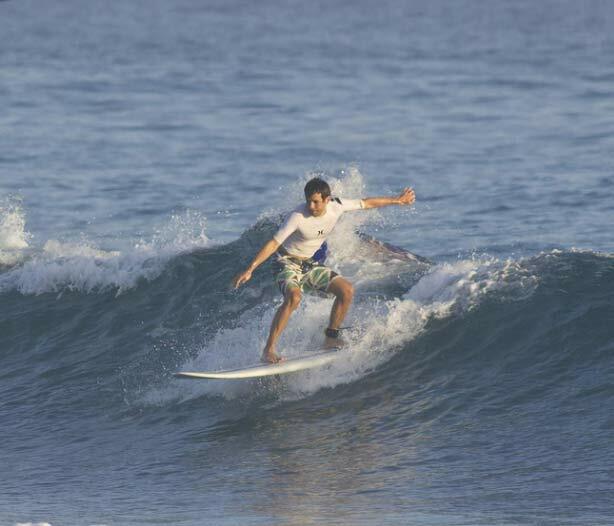 We offer stylish & comfortable surf accommodation in the cool surf town of Cabarete. Full packages with airport transfers, surf board rental pool, lessons ( or surf coaching if you already know the basics of surfing), Breakfast and 4 dinners. Have a look at the packages we offer at Swell; the #1 Surf Resort in the Caribbean.